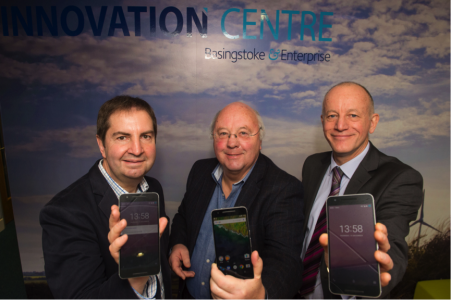 Following the Chancellor’s call to action to make the UK a world leader in 5G, a brand new 5G mobile network emulator launched at the Basing View innovation hub in Basingstoke last week (15 December). The opening also follows last week’s news that the National Infrastructure Commission (NIC) reported 5G would play a crucial role in the economy, and that mobile connectivity had become a necessity in society. The new facility will be a first step towards achieving this, allowing start-ups and businesses working on mobile applications to develop systems capable of operating on the next generation at an early stage. The 5G emulator was built through a significant investment from the Enterprise M3 LEP growth fund, with expertise supplied by the 5G Innovation Centre at the University of Surrey, and supported by SETsquared, Basingstoke and Deane Borough Council and high-tech start-up Gematech. Digital entrepreneurs, start-ups and scale-up businesses will be able to access the facility through SETsquared’s new digital hubs based in growth towns in the Enterprise M3 region, as part of its Digital Business Acceleration Hub programme. Keith Robson, chief operating officer of the 5G innovation centre at the University of Surrey, said: “This centre is the first in the UK where SMEs and start-ups can get direct access to 5G test and demonstration facilities directly connected to the £75m R&D facility at the 5GIC. We are taking a very integrated approach to this totally new generation network, which will be used worldwide. Start-ups and entrepreneurs will first get a chance to experience the 5G emulator through SETsquared’s Entrepreneurship Training Programme, taking place on 2 and 3 February 2017. The two-day hands-on course funded by the European Regional Development Fund (ERDF) will cover all the essential elements of starting a business, including problem/solution fit, routes to market, identifying the opportunity and financial fundamentals. Basingstoke and Deane Borough Council’s Leader Cllr Clive Sanders said: “This is an amazing opportunity for the borough, especially for start-ups and smaller firms, to be at the forefront of this world-leading technology. There is a real drive to establish this area as a leader in 5G. The world focus is on Surrey University and the innovative development of this cutting-edge technology. 5G network connections are faster than any previous version, with the download of a full HD movie taking under 10 seconds to download. Small businesses such as start-ups and scale-ups would usually not have access to a facility of this kind, with many 5G test-beds only available to large corporates. The 5G emulator was launched with a technology demonstration from Gematach, showing how the network handles 4k video and works with IoT devices connected around the room. Free places will be allocated based on the strength of the business case put forward in the application.